All I can say is, Bryan Singer left the franchise at the right time. He really opened the door for Marvel movies with the first X-Men, and expanded upon that with the epic X2: X-Men United. Then it went downhill with The Rat's marginal X-Men 3: Last Stand and now Gavin Hood's X-Men Origins: Wolverine. I don't know where he went wrong... Hood's last 2 movies were fantastic (Rendition and Tsotsi). This movie is an origin story to the Wolverine character from the X-Men movies. It follows Wolverine and his brother Victor (Sabretooth) as they grow up and fight together to the eventual fallout and rivalry between the two. Major Strkyer (from X2) plays a pivotal role as the man who forms a secret operative team for the government, and in doing so hires the brothers. Wolverine has disagreements with the team and leaves to start a life of his own in Canada. However, trouble soon finds him. During the opening credits, they do this montage of scenes of where Sabretooth and Wolverine fight together in a bunch of wars within the last century. I was thinking to myself, THIS is the movie I want to see, forget the "origin" stuff. How cool would it be to watch Wolverine fight a bunch of Nazi's, and plus, they can tie-in with the comic book story of how he fights back to back with Captain America... easily introducing him for the upcoming Avengers movie! I'm going into spoiler territory in the next few sections, be warned. There were too many loopholes in the story. The first stupid thing is with the faked death of Kayla. How could Wolverine, with his superhuman sense of smell, not detect that it wasn't her blood that she was drenched in. And moreover, she wasn't wounded by Sabretooth but drugged, so how foolish was Wolverine then to not check to see if she had any wounds. Surely that would have provided a huge scent. Another misstep was regarding Stryker's plan to take Wolverine's powers. If it was his plan all along to make a Weapon XI, then why all the fuss with fusing Wolverine's bones with adamantium? He just created an indestructible beast. I told this to my friend Matt after the movie finished. He suggested that perhaps Stryker was testing Wolverine's limits too see how much pain he could withstand. It's plausible, but if this is the case, then shame on the writers for not making it more clear. And if that were true, how stupid was Stryker for completely depleting themselves of adamantium. One last plot hole, what exactly was Sabretooth's motive? When he went on the killing spree, did he "kill" Kayla in revenge for Logan dropping out of the military group? But no it can't be, because it was a ruse to trick him in letting Stryker take his power. So why after this is all revealed does Sabretooth want to attack Wolverine? It's pretty flimsy and again I blame the script and the writers. The last thing that annoyed me was some of the shoddy CG work in the movie. There are scenes where the effects look half-assed and its doubly baffling because in the previous three movies, the effects were fine. Two scenes in particular stood out. The first is when Wolverine is in the bathroom looking at his new metal claws... tell me that's not amatuerish work. That had it right before, what happened? The other one would be the youthful appearance of a clearly CG'd Professor X. It was laughable. I'm sure there are more that you could point out, but those stood out for me. If you skipped the above section, all I said was that there plot holes that bothered me and CG effects that were horrible. It didn't help me like the movie at all. But, I'm not too full of hate. There were performances in the movie that I liked. In particular Liev Schreiber as Sabretooth and surprisingly, Will.I.Am who played John Wraith (a black cowboy dude who was like Nightcrawler). I thought Schreiber really brought out the gritty attitude of Sabretooth despite the poor script he had to work with. Will.I.Am really surprised me only because he's known more for his singing than his acting (to which he's done basically none). He seemed like a really likeable character so it's too bad that he had to bite the dust. 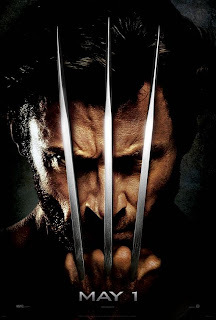 In an interview with Hood, he's hinted that there may be a sequel in the works and that it will take Wolverine to Japan, which is a storyline from the comics. Hopefully that will please the die-hard fanboys after this atrocity. Anyhow, what the critics wrote about this movie was correct: save your money and go see Star Trek. Thankfully, me and my friends went on a Tuesday and only had to pay $4.99. It was worth exactly that. I agree with both scenes you talked about... terrible!! And I'm not in the loop with stories and Marvel and effects, so everything just looks awesome to me. Haha! Except yes, Xavier was pretty fake looking! Hey Ally, yes, hopefully I'll get to see Star Trek soon! My sister watched it on opening night and loved it. And usually she doesn't like those kinds of movies so it tells me a lot. Hey Beka, yah, before the movie started I was saying to Matt, I'll have to turn off my brain for the next 100 minutes. So I tried, but the geek in me was too strong and prevailed. But at least you guys liked it, so not a total loss. Actually, they made it VERY clear that he infused Logan's bones with adamantium just so he could see if his powers would allow for the process to work. All the previous "weapons" were to make the ultimate soldier, XI. I feel they explained that just fine. Maybe it wasn't the movie as much as you wanted it to be a little less subtle? I feel X 1 and 2 were travesties whose only value was nostalgia. This one actually had a believable story. I do agree with your assessment of the Kayla ruse. It would have been easier just to kill her than to bother setting up the scam.